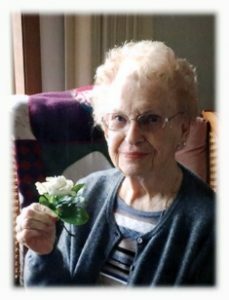 Betty A. Baumann, 90, of Waubeka, WI died peacefully at home surrounded by her family on January 12, 2019. She was born April 2, 1928 in Alexandria, VA to Joseph and Catherine Curtiss Woodyard. She graduated from Mount Vernon High School and worked for the Virginia Electric Power Co. She met Roger Baumann, a Marine at Camp Lajeune in North Carolina. They married October 22, 1953 in Jacksonville, NC. They moved to Waubeka, WI where Roger worked the family business, Baumann Meats. She was a proud homemaker and helped at the family market over the years. When the children were young she was active in their schools. Betty was an active member of St. Paul’s United Church of Christ in Waubeka, WI, especially with the Ladies Guild. She was also a member of the American Legion Post 410 Auxiliary, Fredonia, WI and their annual Blood Drive for many years. She enjoyed cooking, baking and tending to her garden. She was a proud grandma and attended sports events for her grandchildren and great-grandchildren and Special Olympic events with her grandson Matthew. She also enjoyed spending winters in Florida with her husband. He preceded her in death March 20, 2009. She is survived by her children Glenn (Bonnie) Baumann of Fredonia, WI, Cheryl Lorge of Sarasota, FL and Lori (David) Preisler of Fredonia. She is further survived by her grandchildren Tracy and Heidi Baumann, Ryan (Jackie) and Nic Lorge, Matthew and Amber Preisler; great-grandchildren Kendall and Griffin Lorge and Lleyton Allen, sister-in-law LeeRaye Baumann of Fredonia, WI, nieces, nephews, other relatives and friends. She is preceded in death by her husband Roger, son Bob Baumann, brother William Woodyard and brother -in-law Clifford Baumann. Private family services have been held with interment in St. Paul’s United Church of Christ Cemetery, Waubeka, WI. Memorials to Special Olympics of Ozaukee County appreciated.